Best pub in the area. Been coming here since I moved to the neighbourhood and always made to feel welcome. I�d hesitate to call it a gastropub, mainly because I hate that word, and although the food is gastro-quality and the menu chalked up on an old-school blackboard, this place is nothing like those lah-de-bloody-dah places down Islington way. Just an honest-to-goodness local with great food and zero pretension. And anyway, there�s no pressure to eat, you can just spend a pleasant evening drinking here with a bunch of friends. Well-chosen international selection of wines, the usual Continental lagers, and a good choice of ales and bitters (if I knew anything about ale and bitters, that is). If you are eating, look out for the special six-quid lunches on weekdays, and the hangover-busting breakfasts at the weekend, as well as the Sunday roasts. Clientele is a friendly mix of locals, the odd character, and people from the nearby creative studios and offices. A suit was spotted here once, but thankfully didn�t last long. And because it�s away from the main Camden drag you don�t get any of the extraterrestrials or Bacardi breezer brats who make Camden on a weekend resemble something out of Dawn of the Dead. No jukebox or piped music either, but a creaky old Joanna in the corner. My only complaint is the yummy-mummies who occasionally swoop in for lunch with their screaming spawn, and convince me that Herod had the right idea after all. But apart from that, highly recommended. Oh, and there�s a theatre upstairs as well. I had not been to the Lord Stanley for a couple of years but on Sunday evening and thought I would pop in for a pint. 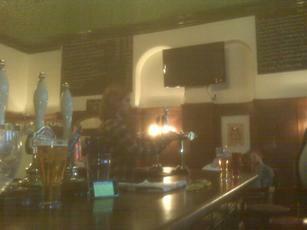 There beers are well kept, I had a great pint of Landlord and they had Doom bar & EPA on tap. I didn't try the food but it looked pretty good. I�ll defiantly be popping back again. Boring gastro pub with expensive beers and polite men in Moss Bros. suits chatting up Islingtonian girls who read the Guardian. OMG!!! Have just checked back on this review. Can I just say I am totally loving how much I've wound up these old grumps by just telling the truth - maybe it means they won't come back and litter the place with their negative vibes...yaaaay, WOOOO HOOO!! TRUST ME I don't work for anything to do with The Stanley, mine was an honest review. I'm just a satisfied customer telling the truth. Besides, it's not like they need any help from me - the place is always busy, bustling with happy, friendly customers. I still go there loads and LOVE LOVE LOVE it every time. Can't wait for that adorable little garden to open up. I have also branched out with my wine choices: the Picpoul de Pinet I mentioned before is so so good and perfect for a special treat but there is also a white called Il Banchetto which is really reasonably priced and lovely. Ha ha - jimmywicks, nice one mate - totally agree with you. Why be spiteful or sarcastic? It's just not helpful. The place can't be that bad if these reviewers keep returning. If you ask me that Green_Onions seems pretty obsessed with the Stanley - kind of creepy/weird isn't it - perhaps it would be better for all involved if he did stay at home with his �5 steak - ha ha!! My thoughts - Ace pub - I started drinking there a few months after my old local went seriously downhill. I mainly drink there after work sometimes have the pasta or a steak and in my opinion �17 for quality, decent sized rib eye with homemade chips and bearnaise isn't half bad. Recently have also been down on a Sunday with the Mrs. It's a great place to chill and read the papers. Pretty much every table was full but it was nice not to be turfed off our table after we ate to make way for more diners - which seems to be policy at loads of pubs nowadays. Would really recommend this place to anyone - chilled, nice staff, good attitude to the whole thing and good value for money too. Top marks from me.